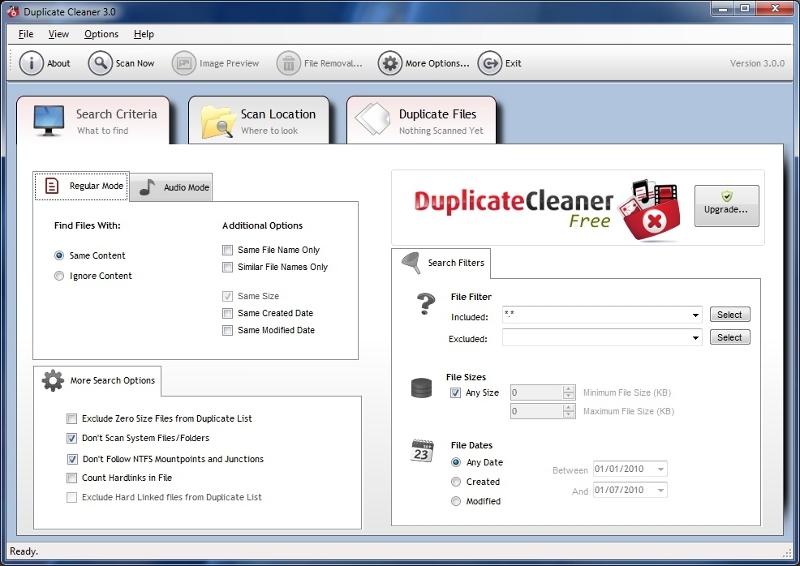 Duplicate Cleaner Free 3.0 Free Download - Find and delete duplicate files and music on your hard drive or network. Free. Cleaner hard drives means faster performance! Save disk space by finding and deleting duplicate files on your hard drive or network. Duplicate Cleaner can find duplicate files, music (MP3, M4A, M4P, etc), photos, videos or documents - if it is duplicated on your system then Duplicate Cleaner will find it! It then offers you many ways in which to safely select and move or delete these files. Features: Lightning fast scanning, music and image scanning, selection assistant and more. Statement: First, please download the orginal installation package by clicking the download link. Of course you may also download it from the publisher's website. Using Duplicate Cleaner Free crack, key, patch, serial number, registration code, keygen is illegal. The download file hosted at publisher website. We do not provide any download link points to Rapidshare, Hotfile, Depositfiles, Mediafire, Filefactory, etc. or obtained from file sharing programs such as Limewire, Kazaa, Imesh, Ares, BearShare, BitTorrent, WinMX etc. Software piracy is theft. If you like Duplicate Cleaner Free please buy it.